Kerry Ward (far right) of the LOC VHP, reads postcards sent home by U.S. Veteran Don Shearer, who was a German prisoner of war during World War II. Shearer’s wife, Martha, shared his story and artifacts. On Nov. 10, the National Court Reporters Foundation (NCRF), in conjunction with the Library of Congress (LOC), collected the oral histories of 10 U.S. veterans who served in various wars during a Veterans History Project (VHP) event held at the Ginger Cove Retirement Community in Annapolis, Md., in honor of Veterans Day. The stories were from veterans who served during World War I, World War II, and the Cold and Korean wars. Michelle Houston, a captioner from Brandywine, Md., transcribes the war stories of U.S. Veteran Patrick O’Keefe, who served in World War II. 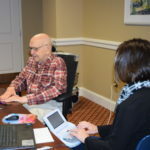 Since 2003, members of the National Court Reporters Association (NCRA) who volunteer their services have worked with NCRF and the LOC to record and transcribe the moving stories of nearly 4,300 U.S. war veterans, building a lasting legacy of the diverse group of men and women who have served our nation during times of war. The interviews are then submitted to the LOC, where they are archived for later use by scholars, students, and future generations. The interviews have been taken during special VHP days held around the country and hosted by state and local court reporting associations, firms, and individuals. 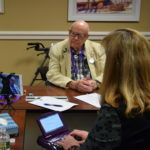 Nationally, NCRF has hosted a number of VHP events that have captured the unique and compelling stories of veterans, including several Purple Heart recipients and from veterans of World War I and those since then. 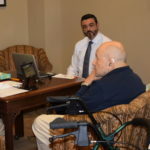 NCRF has also hosted three Hard-of-Hearing Heroes Project events that used volunteer captioners to enable veterans with varying degrees of hearing loss to be interviewed so their experiences could be chronicled. The Hard-of-Hearing Heroes Project was supported by a grant from the American Society of Association Executives. 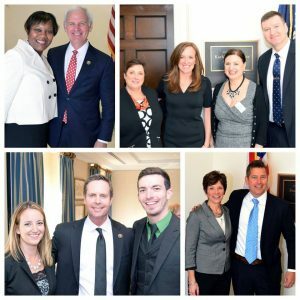 NCRA Board of Director member Steve Clark, a captioner from Washington, D.C., captures the story of U.S. Veteran John Henderson, who served in World War II. 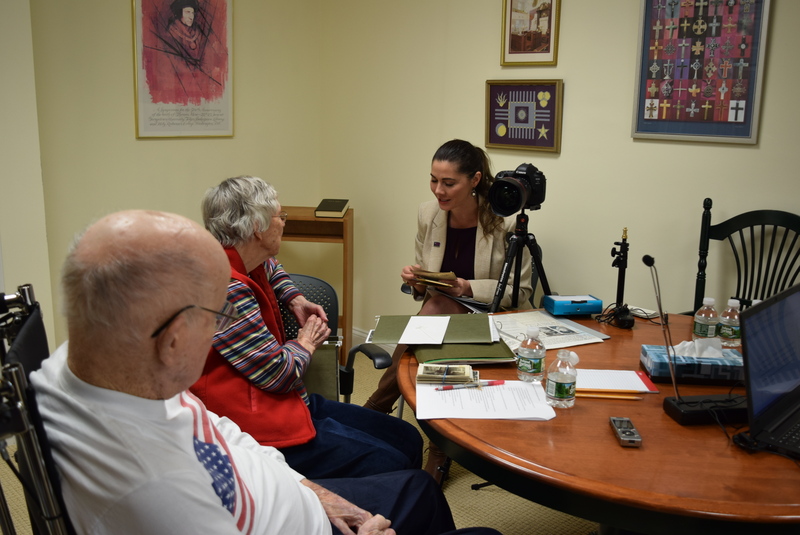 Kerry Ward, liaison specialist with the LOC VHP, interviewed Martha Shearer, the wife of Don Shearer who served in WWII and was a German POW. Mrs. Shearer spoke on behalf of her husband who was also in attendance but suffers from Parkinson’s disease. Ward was clearly moved by the many photos and letters shared by the Shearers, especially reading the postcards sent by Don from the German prison camp where he was held to his mother back home. Ward noted that these were especially valuable to be included in the VHP archive collection. Ginger Cove resident Tess Zarba, who is 92 years old, shared her father’s story of service in WWI with interviewer JoAnne Luciano. “It was really interesting to hear about what service was like for our soldiers back then and to see the photos and letters and other items Tess shared with me about her father’s service to our country. I learned so much,” noted Luciano. NCRA Director Steve Clark, CRC, a captioner from Washington, D.C.
Cindy Davis, RPR, an official court reporter from Annapolis, Md. Bev Early, a captioner from Washington, D.C.
Tonia Harris, RPR, an official court reporter from Washington, D.C.
Michelle Houston, RPR, a captioner from Brandywine, Md. Julia LaCava, RPR, CRR, CRC, an official court reporter and captioner from Alexandria, Va.
Linda Lindsey, a freelance court reporter from Preston, Md. Maellen Pittman, RDR, CRI, CLVS, a CART captioner from Baltimore, Md. 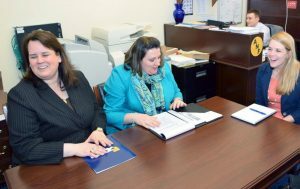 Christine Slezosky, RPR, CRC, a CART captioner from Chambersburg, Pa.
Cindy Davis, an official court reporter from Annapolis, Md., transcribes an interview with U.S. Veteran John Kenny, who served in World War II. 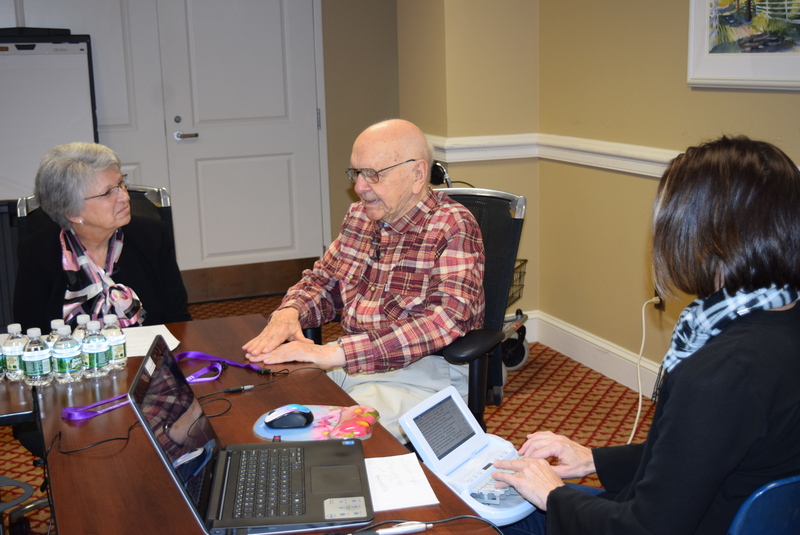 Davis, who has transcribed previous interviews from recordings for the VHP said that she would encourage all court reporters and captioners to participate in a VHP event because their stories are fascinating and important to preserve. An interview with U.S. Veteran James Andreatta, who served during the Cold War, was transcribed by Christine Slezosky, a captioner from Chambersburg, Pa.
“Every day we lose more of our veterans. 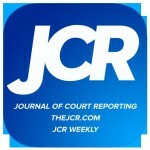 Who better to record their stories than a court reporter? 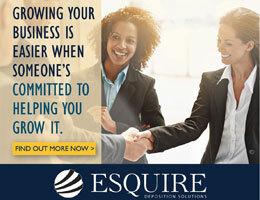 The most gratifying part is just knowing I contributed,” she added. 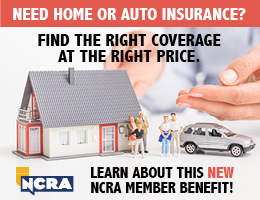 Learn more about NCRF and the Veterans History Project. Radio station WTOP in Washington, D.C., posted an article about NCRA’s and NCRF’s involvement with the Veterans History Project program. 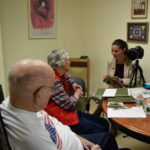 The Daily Item posted an article on Oct. 26 about NCRA member Colleen Wentz, RMR, CRR, a freelance court reporter from Middleburg, Pa., who is helping local veterans record, in their own words, their military experiences as part of the Veterans History Project. On Oct. 18, Riverbend.com reported that NCRA member Jill Layton, RMR, an official court reporter from Toledo, Ill., represented the Illinois Court Reporters Association at a recent VHP event hosted by the Illinois Secretary of State Jesse White. On Sept. 20, the Hon. 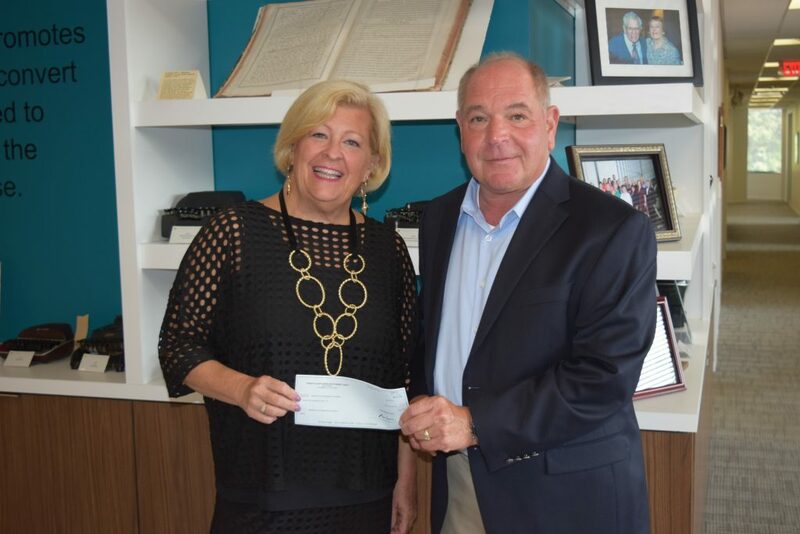 Michael Cicconetti of the Painesville Municipal Court, Painesville, Ohio, presented NCRA CEO and Executive Director Marcia Ferranto with a $25,000 check in support of the National Court Reporters Foundation’s (NCRF) Veterans History Project efforts during a visit to the Association’s Reston, Va., headquarters. 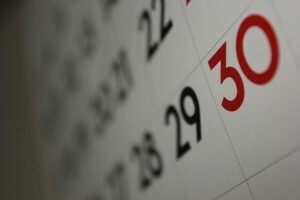 The grant was generated from money remaining from a class action suit. Funds that go unclaimed in such suits are typically placed in a trust fund by the legal firm representing the plaintiffs. Once the funds have been disbursed, any remaining money is either distributed as grants to nonprofit and charity organizations, or in some cases, returned to the defendants. “The work that NCRF and the members of NCRA do to help ensure the valuable stories of our war heroes are preserved for generations to come through the Library of Congress Veterans History Project is priceless,” said Cicconetti, who is a past NCRF Trustee and longtime supporter of the court reporting and captioning professions. Cicconetti suggested that the Foundation apply for the grant. “This grant will go far in helping these committed volunteers to continue to be able to capture these important historical stories for our children and their children to read and better understand and appreciate the many sacrifices those who serve in our military forces make to keep this nation safe and free,” added Cicconetti, who has been recognized nationally and internationally for his creative sentencing strategies. “It is an honor to have Judge Cicconetti as such a good friend and supporter of the Foundation and its programs and of the court reporting and captioning professions. He understands how important the human factor in these professions is to ensuring an accurate record is made and in the benefits these stenographic skills can provide to the Deaf and hard of hearing,” said NCRF Deputy Executive Director B.J. Shorak. 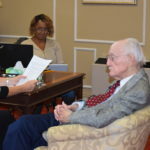 Since 2003, NCRA members who volunteer their services have worked with NCRF and the Library of Congress to record and transcribe the moving stories of nearly 4,300 U.S. war veterans, building a lasting legacy of the diverse group of men and women who have served our nation during wartime. The interviews are then submitted to the Library of Congress, where they are archived for later use by scholars, students, and future generations. The interviews have been taken during special VHP days held around the country and hosted by state and local court reporting associations, firms, and individuals. 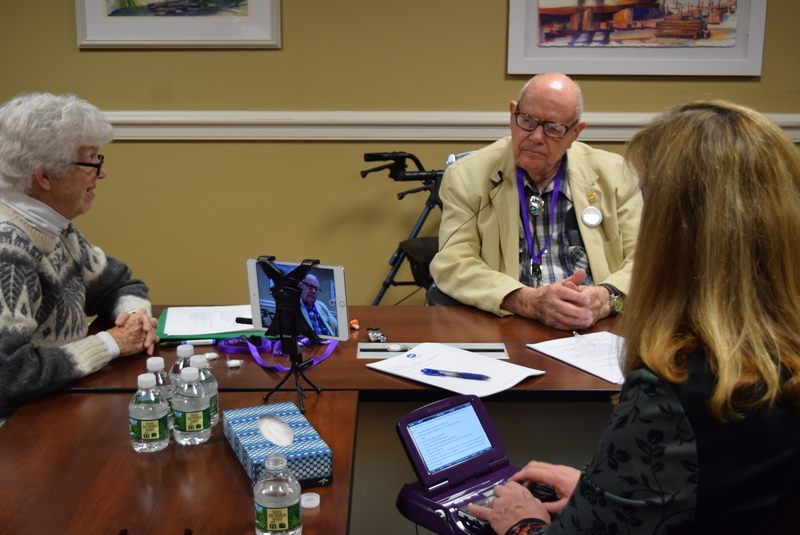 Nationally, NCRF has hosted a number of VHP events as well that have captured the unique and telling stories of veterans from World War II forward, as well as Purple Heart recipients. 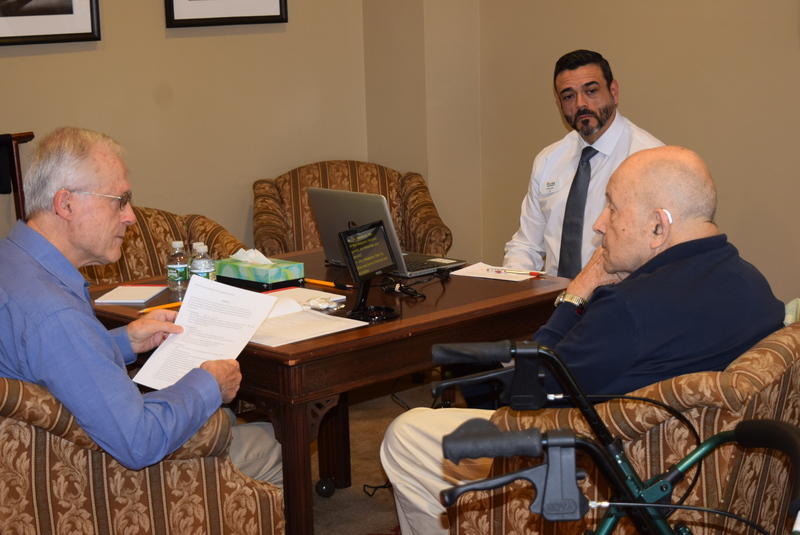 NCRF has also hosted three Hard-of-Hearing Heroes Project events, supported by a grant from the American Society of Association Executives, that used volunteer captioners to enable veterans with varying degrees of hearing loss to be interviewed so their experiences could be chronicled. The Foundation will host a VHP event at the Ginger Cove Retirement Community located in Annapolis, Md., near the U.S. Naval Academy, on Sat., Nov. 10. For more information or to volunteer to participate, contact Sharon Davoren, Foundation Assistant, at sdavoren@ncra.org. 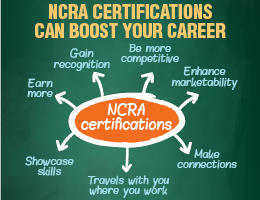 NCRA members who volunteer for VHP events can earn Professional Development Credits. “The NCRA Legislative Boot Camp was a tremendous training opportunity,” said Rachel Waterhouse-Schwalm, RPR, a freelancer and owner of Westphal Reporting, in Dubuque, Iowa. Waterhouse-Schwalm attended the 2016 NCRA Legislative Boot Camp and is currently the president-elect of the Iowa Court Reporters Association. “I continue to use the skills we received training on to this day, and they will always be of value,” she said. The 2018 event has two days of sessions on decision-making, grassroots lobbying, certification legislation, and more. But what makes this event unique is the location: our nation’s capital, Washington, D.C. While many of the sessions at Boot Camp are new, attendees will still have the opportunity to take the lessons they’ve learned and practice their new skills in mock meetings. In these mock meetings, attendees will test their strategies for speaking with legislators, and they will receive feedback to tweak their messaging and delivery. On the final day of the event, attendees will get the full D.C. experience, traveling by Metro to Capitol Hill and spending the day meeting face-to-face with their elected officials and staff and talking to them about the important issues that affect court reporting and captioning today. After a full day of D.C. action, attendees will wrap up their experience with a reception in the beautiful Library of Congress honoring the popular Veterans History Project (VHP). Many NCRA members have participated in the VHP, and this reception will help them have a deeper understanding of the value of this project and reporters’ and captioners’ participation in it. The reception will also allow attendees to compare notes and share wins from the day. Register for the 2018 NCRA Legislative Boot Camp at NCRA.org/BootCamp by Feb. 23. On Nov. 20, the Courier Tribune posted a photo with a caption from a Veterans History Project hosted by the Missouri Court Reporters Association. 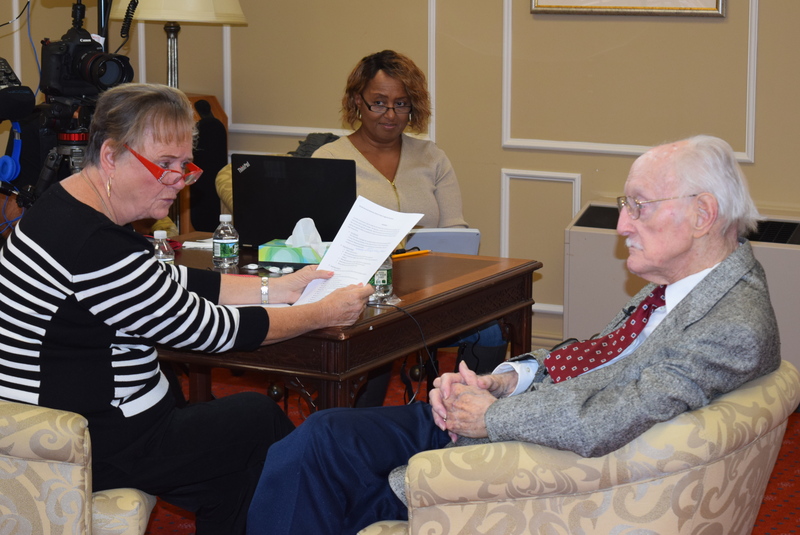 The Lake County News-Sun posted an article on Nov. 13 about the sixth annual Veterans History Project held at the Lake County Courthouse, Ill. NCRA member Kathy Fennell, RMR, an official court reporter from Matteson, Ill., was on hand to transcribe.